Matematicas Visuales | Leonardo da Vinci:Drawing of an augmented rhombicuboctahedron made to Luca Pacioli's De divina proportione. 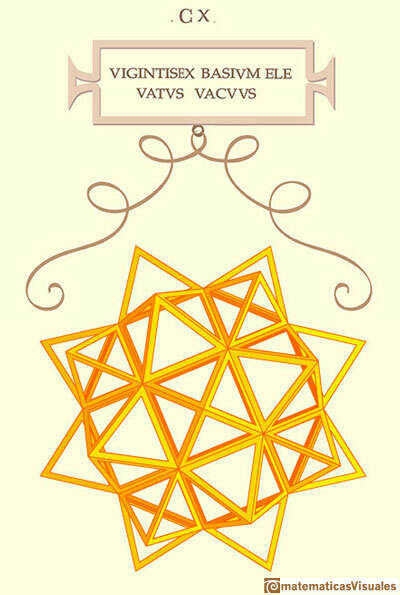 This interactive mathlet is an adaptation of the drawing that Leonardo da Vinci made of the augmented rhombicuboctahedron (Vigintisex basium elevatus) for Luca Pacioli's book 'De Divina Proportione'. 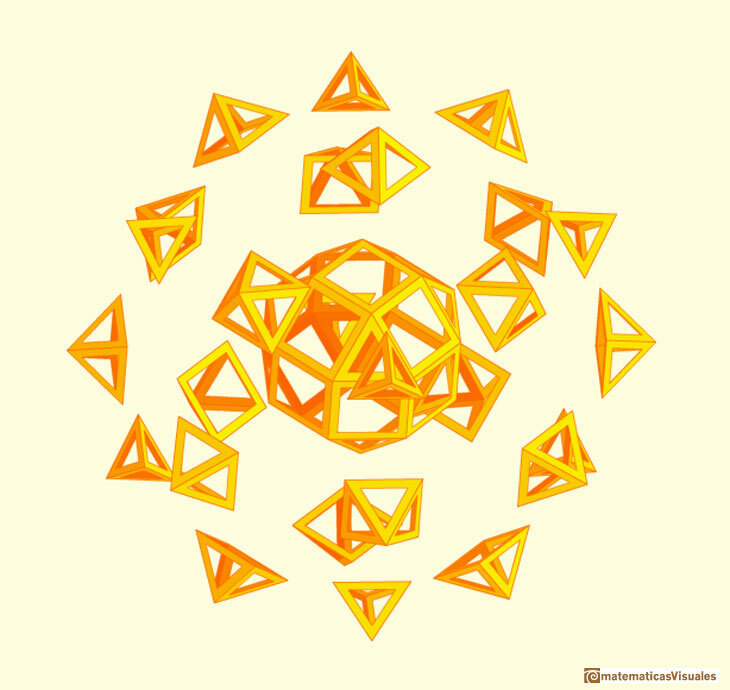 The process of adding pryramids to a polyhedron is called 'augmentation'. Adding six pyramids to a cube you can build new polyhedra with twenty four triangular faces. For specific pyramids you get a Rhombic Dodecahedron that has twelve rhombic faces. In this page we are going to study the augmented rhombicuboctahedron. Leonardo da Vinci:Drawing of a rhombicuboctahedron made to Luca Pacioli's De divina proportione. 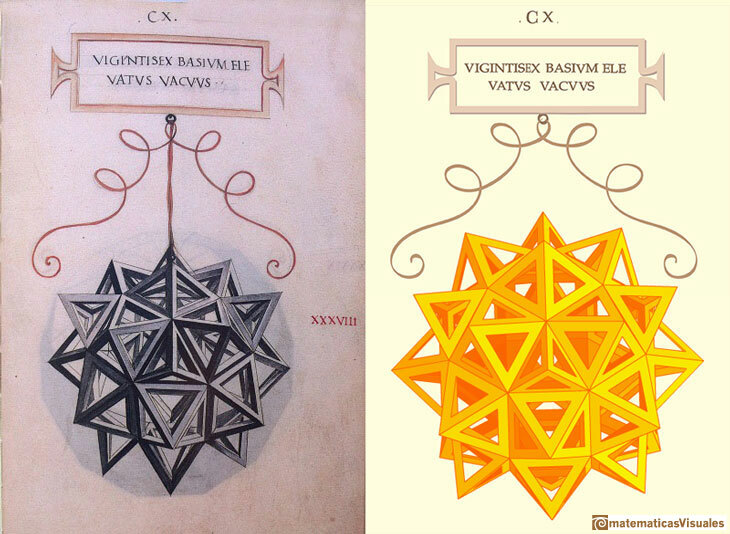 Leonardo da Vinci made several drawings of polyhedra for Luca Pacioli's book 'De divina proportione'. Here we can see an adaptation of the rhombicuboctahedron. "El cuerpo de veintiséis bases sólido o hueco elevado recibe en su formación ciento cuarenta y cuatro líneas que, unidas entre sí, según las oportunas exigencias, originan en él doscientos ochenta y ocho ángulos superficiales y veintiséis sólidos elevados piramidales, dieciocho de los cuales son deterinados por cuatro ángulos agudos superficiales y ocho por tres agudos. Está compuesto dicho cuerpo por veintiséis pirámides lateradas, dieciocho de las cuales son cuadrangulares y ocho triangulares, que se pueden discernir por la vista en el exterior, y por el mencionado cuerpo de veintiséis bases sólido plano, interior, que solamente puede ser captado por la imaginación. Sus veintiséis bases son igualmente bases de las antes mencionadas veintiséis pirámides, es decir, las dieciocho cuadrangulares de las dieciocho pirámides cuadrangulares y las ocho triangulares de las ocho pirámides cuadrangulares." Leonardo da Vinci's drawing of the augmented rhombicuboctahedron (Vigintisex basium elevatus solidus) for Luca Pacioli's book 'De divina proportione'. (There is an Spanish version, 'La divina proporción' Editorial Akal. Image used with permission of Editorial Akal). Leonardo da Vinci's drawing of the augmented rhombicuboctahedron (Vigintisex basium elevatus vacuus) for Luca Pacioli's book 'De divina proportione'. (There is an Spanish version, 'La divina proporción' Editorial Akal. Image used with permission of Editorial Akal). We can play with a second versión of this interactive application and see the interior of this polyhedron. We can compare Leonardo da Vinci's drawing with the image generated with the application. 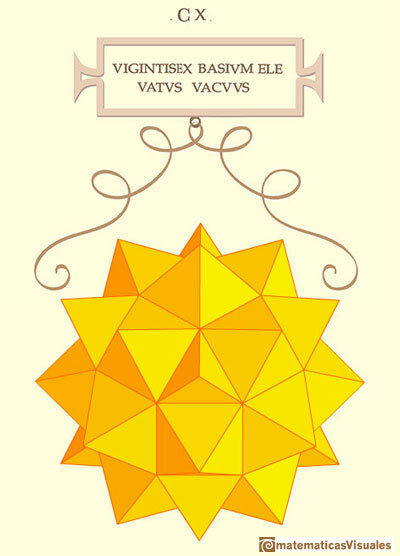 Leonardo da Vinci was a genius, his drawings for Pacioli's book are wonderful and this is only an anecdote that alow us to study and enjoy this beautiful polyhedron. If we look at the two pyramids that point directly left and right we see something odd. They should be two cuadrangular pyramids but it is not clear if they are triangular or quadrangular. Perhaps it depends on the observer's point of view. The apexes of two triangular pyramids at the bottom left and right seem to be missing. The main difference is that the pyramid at the bottom should be triangular but it is quadrangular in Leonardo's drawing. The two pyramids adjacent to it should be quadrangular and symmetric. 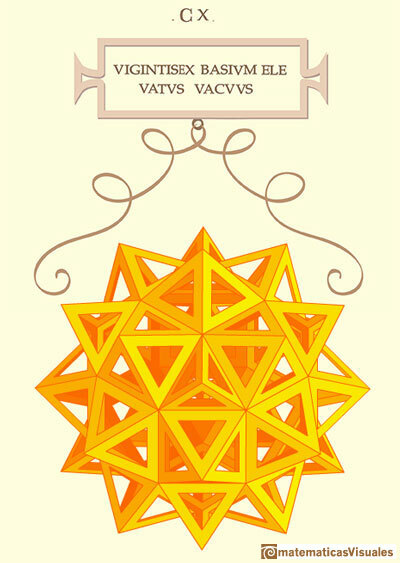 As Huylebrouck pointed out, Leonardo da Vinci was the first to draw the rhombicuboctahedron for print and then he had to add pyramids and then draw this augmented star-shaped polyhedron (Pacioli called this kind of polyhedra 'elevatus'). We do not know if he had a model. A different opinion was published by Carlo H. Sequin. He thinks that Leonardo was depicting an augmented pseudo rhombicuboctahedron rather than an augmented rhombicuboctahedron. Then the main problem, the pyramid at the bottom, is now a quadrangular pyramid and Leonardo was right. We are going to take a look comparing Leonardo's drawing and the augmented pseudo-rhombicuboctahedron. But there is a big objection to this point of view: if we read Pacioli's book he wrote about several polyhedra in the same order ('planus solidus', 'planus vacuus' 'elevatus solidus' and 'elevatus vacuus'). Then he explained the reader the rhombicuboctahedron ('planus solidus and vacuus') and the augmented rhombicuboctahedron ('evelatus solidus and vacuus') and those are the drawings that we expect from Leonardo. The next application is an adaptation of Leonardo's drawing but in this case we are using a pseudo-rhombicuboctahedron as the polyhedron base of the augmentation. If we use a pseudo rhombicuboctahedron the problem with the pyramid at the bottom is solved but Leonardo's drawing is still not symmetric and we expect an augmented rhombicuboctahedron and not an augmented pseudo rhombicuboctahedron as an illustration for Pacioli's book. Luca Pacioli - La divina proporción - Ediciones Akal, 4th edition, 2004. Spanish edition of 'De divina proportione'. Translation by Juan Calatrava. Rinus Roelofs' web site. Sculptor and Mathematician Rinus Roelofs has a wonderful web site full of beautiful ideas and resources. One example, his article A Mistake in a drawing by Leonardo da Vinci. Dirk Huylebrouck, Lost in Triangulation: Leonardo da Vinci's Mathematical Slip-Up, Scientican American, March 2011. Carlo H. Squin, Lost in Triangulation?? No, -it is not a mistake, -it is a Pseudo Rhombicuboctahedron!. W.W. Rouse Ball and H.S.M. Coxeter, 'Matematical Recreations & Essays', The MacMillan Company, 1947. Peter R. Cromwell, 'Polyhedra', Cambridge University Press, 1999. Leonardo da Vinci's Geometric Sketches Frank J. Swetz's article in MathDl, Loci:Convergence. Leonardo da Vinci's Polyhedra George Hart's excellent website about polyhedra. Leonardo da Vinci: Drawing of a dodecahedron made to Luca Pacioli's De divina proportione. Leonardo da Vinci made several drawings of polyhedra for Luca Pacioli's book 'De divina proportione'. Here we can see an adaptation of the dodecahedron. Leonardo da Vinci: Drawing of a cuboctahedron made to Luca Pacioli's De divina proportione. 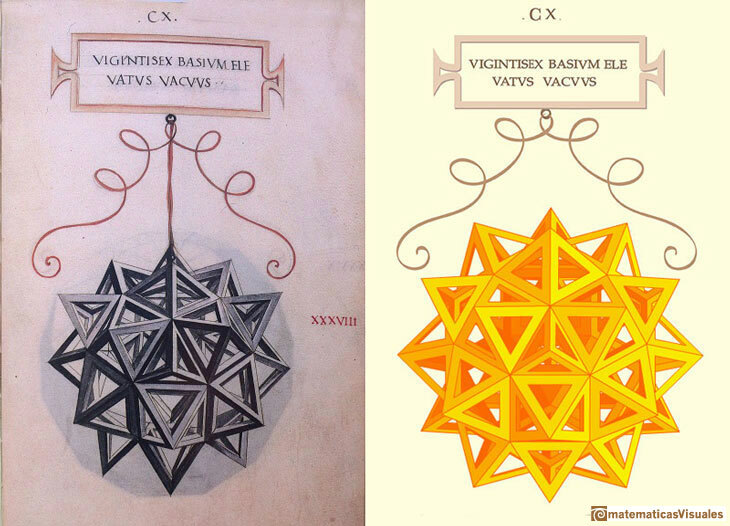 Leonardo da Vinci made several drawings of polyhedra for Luca Pacioli's book 'De divina proportione'. Here we can see an adaptation of the cuboctahedron. Leonardo da Vinci: Drawing of an stellated octahedron (stella octangula) made to Luca Pacioli's De divina proportione. Leonardo da Vinci made several drawings of polyhedra for Luca Pacioli's book 'De divina proportione'. 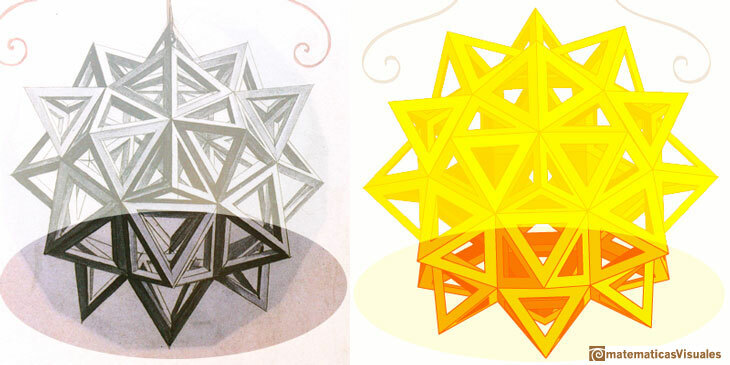 Here we can see an adaptation of the stellated octahedron (stella octangula). Leonardo da Vinci:Drawing of an octahedron made to Luca Pacioli's De divina proportione. Leonardo da Vinci made several drawings of polyhedra for Luca Pacioli's book 'De divina proportione'. Here we can see an adaptation of the octahedron. Leonardo da Vinci: Drawing of a truncated tetrahedron made to Luca Pacioli's De divina proportione. Leonardo da Vinci made several drawings of polyhedra for Luca Pacioli's book 'De divina proportione'. Here we can see an adaptation of the truncated tetrahedron. You can build a Rhombic Dodecahedron adding six pyramids to a cube. This fact has several interesting consequences. Using cardboard you can build beautiful polyhedra cutting polygons and glue them toghether. This is a very simple and effective technique. You can download several templates. Then print, cut and glue: very easy! Material for a session about polyhedra (Zaragoza, 7th November 2014). We study the octahedron and the tetrahedron and their volumes. The truncated octahedron helps us to this task. We build a cubic box with cardboard and an origami tetrahedron. Material for a session about polyhedra (Zaragoza, 23rd Octuber 2015) . Building a cube with cardboard and an origami octahedron. Material for a session about polyhedra (Zaragoza, 13th Abril 2012). Material for a session about polyhedra (Zaragoza, 9th May 2014). Simple techniques to build polyhedra like the tetrahedron, octahedron, the cuboctahedron and the rhombic dodecahedron. We can build a box that is a rhombic dodecahedron. The compound polyhedron of a cube and an octahedron is an stellated cuboctahedron.It is the same to say that the cuboctahedron is the solid common to the cube and the octahedron in this polyhedron.